Welcome to our daily huddle episode number 59. I do apologize that I am on very late today usually I am on on Monday at around 6PM Pacific, 9PM Eastern but right now it’s like 9:30 Pacific and midnight Eastern and the reason why I was not being on live earlier was because I was having a webinar and before the webinar I brought my entire office out to go-karting. For those of you that are on Instagram you have saw that I was actually go-karting with my entire team. I brought everyone from the office. They go to a local place to have some fun because we work hard and play hard at the same time. For those of you that are wondering on Instagram. I got first place okay I was the fastest and obviously it may be because I’m short and because I don’t wait that heavily. So, I was able to go much faster but I almost got t-boned so my back hurts a little bit right. People were pretty rough I guess it was their time to just ram or basically t-boned their boss when they have the ability to do so. Anyway, we’ve got just a quick pep talk on what happened earlier today and why I was late for our daily huddle. I’m not going to waste any time we’re going to dive right in into the five questions that have been submitted to me today and I going to feature them. 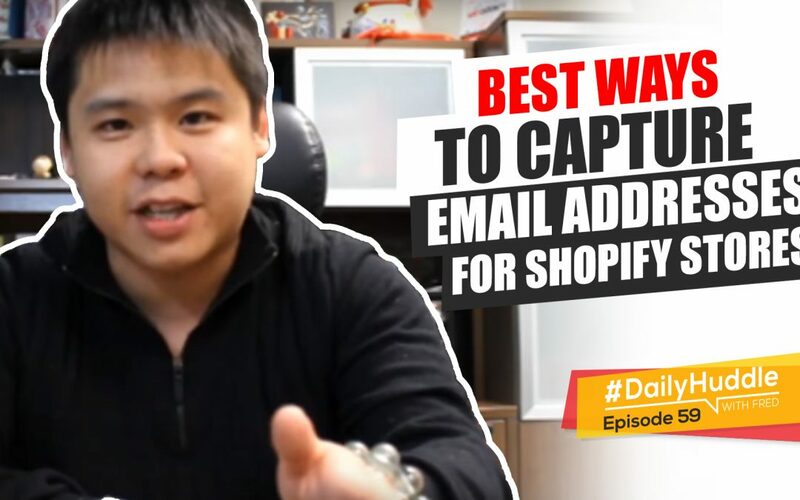 One of them is about acquiring or how to capture or best ways to capture email addresses for your Shopify store. I’m going to talk about it more in detail in just a minute when that question actually gets brought up. [0:02:51] Question 1: What are you using and how do you add the same intro credits snippet to your shows? is this an app or software as I don't seem to see this an option within Youtube, and it makes video appear much more professional than just a thumbnail and a subscribe now card. Hi Fred already in Zero Up and listen to boot camps and daily huddles, loving the tips and rants. Thank you. I do want to say thank you for your support and thank you that you are enjoying my videos and welcome to our Zero Up community. You mentioned the video is the future. I have two questions about your live stream videos that will help me make better use of YouTube. If you do not answer ask one of the 5 questions, would you please hold a training or bootcamp session about this? So here’s the deal for my daily huddle, it’s not really built for eCommerce. I don’t really sell you a physical product. I’m actually doing these daily huddle just to connect with every single of my followers, my fans and also any individuals that really want to learn from me to build a business online or to simply learn advertising or media buying directly from me. So, it’s really a source for media connect with every single one of you. There’s no other intention other than that. I don’t actually make any money doing this. I don’t really sell anything only because again my purpose for my live stream is to just connect with you and letting you know that Fred Lam still exist. He hasn’t been hit by a bus yet knock on wood, just sharing that with you, but at the end of the day, that’s what it’s all about. It’s just connecting me with you right now. (1a.) What are you using and how do you add the same intro credits snippet to your shows? is this an app or software as I don’t seem to see this an option within Youtube, and it makes video appear much more professional than just a thumbnail and a subscribe now card. So here’s the deal, I’m very blessed with having an amazing team. One of my team member from my eCommerce store that’s really good with videos and website design and everything. His name is Kingsley. He actually out of work time helped me created that intro video, the one that you guys are watching in every single daily huddle. He created that intro for me and how I broadcast it is simply using a software called OBS. It is free and I simply overlay that video on top whenever I want and it will showcase right now to every single one of you through my OBS. Although I am on camera right now but it is actually broadcast through the software called OBS. So, I hope that helps you out. Now the second question is (2a.) When we watch live and comment along, what happens to those comments and questions? They do not appear to be the same as the ones that are posted underneath the replay video in YouTube. You say that you read them all and I notice that you reply to questions under the replay, can you reply so that they are publicly or privately seen from livestream? So, right now if you’re on YouTube and obviously all my daily huddles, I don’t pre-record it and actually have it live and broadcast it back to you. I’m actually physically and I am present right in front of you guys. So, this is live I can tell you the time okay the time is 9:30. I’m not making this up. When it comes to the comment, it’s not really a comment. It’s actually a chat box, a live chat box, these live chat box will actually not be added into the comment section. Now, I do see it because when I actually stop the video, I go through the comments see what you guys like what you guys dislike before I close off the page. Once, I close off the page all the live chats are going to be gone. Anyone that comment will have to comment from the replay of the video. I would also love to know if you are using livestream because it is the easier way for you to present your content or if it is because it has better SEO implications for your brand FredLam.com? Thanks for taking time to reconsider and reply Suzy AKA Rye Shed. Suzy, I didn’t really thought about SEO at all when I’m actually building fredlam.com, fredlam.com is where I wanted to actually turn all my videos from my daily huddle, turn it into or transcribe it into text so that you guys can actually go to my website, type in your question and see if that question has been featured. So, you don’t have to wait for that video or for my daily huddle to feature your question. So it’s really me just creating a platform that’s easier for you guys. That’s really it. I never thought about SEO or any side of things. Yes, you may think that I’m stupid because I am obviously wasting that ad set. But, listen I’m not an SEO guy. To me, I never thought about it in that realm of things. So, just to share with you obviously you asked and I answer alright. [0:07:52] Question 2: How to acquire emails on the store page on Facebook and also in the Facebook ads? So moving on to the second question is by Vasile. Vasile inspired me to talk about the subject today. How to acquire emails on the store page on Facebook and also in the Facebook ads? Here’s the deal, there are several ways that you are capturing an email address through your store page and I assume it is Shopify. Three ways : (1) use the app called Willio.I do not get any Commission for saying this. I have been using it. I love it and they are amazing. It’s called Willio. I’m pretty sure you guys may have seen their ads. They have a proven opt-in conversion for email address, for anyone that I want to leave your website. So definitely get that a shot. (2) From your abandoned carts, every time someone put in their information, they abandoned the cart, you capture their email address. (3)When they buy a product from you. These are really, when it comes to eCommerce, three best ways they actually capturing email address because you are not really interrupting the sales process of your product. It is just there and obviously Willio will only show when someone wanted to leave or someone are intending spending more time there and you pop-up a discount where they can actually gamify to actually play that wheel and give you their email address to get a discount. These are the three ways and best ways for you to capture email address. Now, you’ll be wondering well Fred how can I actually create a Facebook Ad geared towards just capturing email address. The best answer is Facebook Lead Ad. I love Facebook Lead Ad. It is actually one of the most overlooked placement and most overlooked strategy by a lot of gurus and a lot of businesses out there right now. Lead ads convert really well and the reason why it’s because when someone click on your ad it is natively having an opt-in page right inside Facebook. The best part is that by default, Facebook will automatically input the email address that you use to log into Facebook and when you start changing the email address field to your actual email address that you checked, guess what – next time when Facebook see or when you click on another lead ad, what’s going to happen is that Facebook will use the email address that you usually use for the lead ad. In that way that again person don’t have to type it again they click once, click again and automatically that email is added in right into your auto-responder. I hope that helps you out. These are the best way to capture email addresses and definitely emails is like the number one asset to any online business only because that is a form of communication where you actually capture the email address guess what, sending an email doesn’t cost you a freaking penny. You can actually send promotions, sales products, affiliate offers to make your money back. I hope that helps you out, Vasile. [0:11:02] Question 3: When creating and assets for LLA, should I leave the interest targeting blank or narrow it down with additional targeting? When creating and assets for LLA, should I leave the interest targeting blank or narrow it down with additional targeting? Here’s some really good question that you brought up and it really depends on where you are at with your pixels. Let’s say that you just recently created your look-alike pixel. If you have done that, then I would overlay a targeting. Now, this targeting got to be in the millions so that you are going after a pretty drastic or massive market with a look alike audience that is a safety net to what you are advertising. That way, you are not just blindly advertising, you’re getting the look-alike pixel or look-alike audience to actually minimize and reduce your risk. However let’s say that you have already having a seasoned pixel, things are doing well and you know that your look-alike is going to be way out of the park and what you wanted to do is simply have no interest, your whole goal and intention for look-alikes is really no interest, no targeting just going after look-alike and if you’re able to actually get back to convert and obviously it really depends on where your source of your look-alikes are. If you actually upload an email list with all your customers and create a look-alike off of that it usually converts like gangbusters. That will also open up a really massive market where you don’t even have to worry about targeting anymore, you just let Facebook do its job, run the look-alike pixel. Now here’s the deal, look-alike pixel can also experience ad fatigue because 1 million or 1% look-alike, you’re going to get around 1.2 million audience size. If you actually have been running the app for a quite a long time with larger budget that 1.2 million people will exhaust at one point, that’s why there are two steps for you to do (1) refresh your creative, (2) is to simply upload a new customer list. Let’s say that January customer list is already uploaded and you want to upload February list and re-run the look-alikes, what’s going to happen is that the February list and the January list look-alike will basically have a difference and you are basically expanding yourself to more look-alikes and giving you the ability to target more people. I hope that helps you out. [0:13:47] Question 4: As a new sales person, how can I compete with other online top sellers on Shopify who has a lot of reputation and tons of reviews? As a new sales person, how can I compete with other online top sellers on Shopify who has a lot of reputation and tons of reviews? The answer to your question is you don’t compete and the reason why I’m saying you don’t compete is because again, you may advertise the same product or have the same product as the top seller but the top seller may not be advertising to the same audience as who you are advertising. Here’s the deal, I just did a webinar about it earlier today. Right now in 2021, three years from now eCommerce is expected to double in transaction in just 3 years to $4.5 trillion. This year, it is projected into 2.27 but by 2021, it’s going to be $4.5 trillion. So, it’s almost double not exactly double, but almost double in transactions. That means that there are going to be more people buying online. There’s going to be more products that’s coming online and obviously if you are always being ahead and if you always been on pushing forward with your business, it doesn’t matter if it’s a top seller or not. It all drills down if the financials and the data makes sense for you are not. That’s why I have the four level of optimization. I keep telling you that data tell you the story. [0:15:22] Question 5: Do you have a guide or tutorial on how to apply a pixel for a product if you have a general store? You also mentioned you have an app that can help me with that. Where can I get that app? Do you have a guide or tutorial on how to apply a pixel for a product if you have a general store? You also mentioned you have an app that can help me with that. Where can I get that app? Thank you. Great question – the app is called Pixabay. It’s $9 a month and it will eliminate your general store problem and obviously not to confuse your Facebook pixel. Even if you have a niche store, I highly recommend you to actually get Pixabay. If you basically want the entire background story and exactly what Pixabay do. Simply go to my YouTube channel, search for Fred Lam and then what am I asked previously a have something called Ask Fred Lam Show, in the Ask Fred Lam Show, there is two videos I believe that I really went in deep about turbo-charging your Facebook pixel or supercharger your Facebook pixel I forgot what the exact name was, look for that video and you’ll see exactly what I mean why you need to do that and obviously check out Pixabay inside the app store inside Shopify it is an approved app inside the app store. So I really hope that helps you up obviously I’m not going to cover in-depth about Pixabay only because I don’t want to sell you it. Just go watching yourself and let my other videos do the selling right here today in my daily huddles, I’m just going to do the talking and blabbing and ranting. I don’t have anything to rant today. It’s been a pretty good day today. I’m all good. Before I go obviously today is Monday, how many of us can guess what’s going to happen next? It is officially our kickstart 500. It seems like a lot of people don’t know about this. So, every single Monday, I simply take out $500 cash to invest into a stranger. For those of you that don’t know what happens every single Monday is that I actually have something called the kickstart 500 grant. Every single Monday, I announced the winner where I’m going to invest $500 to an individual where that individual gets to actually use that $500 to build their business because you can technically start building an eCommerce store with less than $100. You can invest in your ads, you can buy a training that you think you will need that will help you. So, whatever it is that is actually going to towards your knowledge, towards your business and obviously not another fancy iPhone or and iWatch, got to be towards their business, towards your knowledge and then what’s going to happen is that I’m going to send you $500. I’m asking nothing in return. This is genuinely just me wanting to actually inspire as many entrepreneurs as possible. I gave a lot of cash away in the last year just to help individuals like you to really get started. I lost track on how much I actually give out. At times, I gave out $2000, sometimes I gave away a thousand, sometimes it gave five hundred but it’s a minimum $00 every single week and I’m wanting to do this for people that are obviously living paycheck to paycheck and just wanted to start an online business but don’t have the extra budget. That’s why I created this kickstart 500 grants. Obviously, if you want to apply for our kick start 500 and grant, all you got to do is simply go to www.fredlam.com/500. There is an application form. You got to answer fully and in detailed before I even select you for your $500. Now on top of that, the day that you received a checklist from me, it’s going to be five items, I’m going to review it and see what they are and if you can actually share with me and tell me that in 30 days that you have accomplished the 5 goals that I assigned to you, my assistant assigns it. I look at it, I tell her to assign it. Once that is done, I will get on a call with you to review your business, help you and get on a full hour consultation call. The only stipulation is that you got to be on camera with me for my next show. I’m actually banking all these right now for my next show so you can see it how I incorporate a business, how I review it and I think it is best for everyone. So, if you guys are excited put in the word ‘five hundred’ here right into the comment box right now while I pull up the email to see who is going to actually grab my $500 today. There you go. Alright, so and I don’t have a drumroll. The full name is Zakaria Buhaya. Congratulations, Zakaria for winning my $500. His story is as follow. My name is Zakaria, 27 year old living in Qatar Middle East for 6 years now. I am an employee in a retail store marketing department dealing with press and local influencers. I came to this country with dream to get a better job, earn money and save it to buy a house and make my life and family better, unfortunately for a young guy 21 years at that time, without any life experience watching fast car every day in the street and people living a luxurious lifestyle while I am struggling my day job 8AM-6PM with a low income and my family suffering from death. I apologize to hear that. I want to change in myself. I’m not going to go into all the detail but he said I have 3 person that I learned from that are Dan Locke, Ryan Moran and you Mr. Fred. Thank you! It means a lot standing behind these two pretty well-known gentlemen. He wants to actually build an eCommerce business and launch it into Amazon at the same time. You even share with me your plans of attack which is amazing, absolutely amazing. So graduations for winning $500, you will actually get in touch with my assistant very, very, very soon. Other than that, that is really it for our daily huddle for today. Again, I apologize for actually being on pretty late but it’s interesting, all you millennials on Instagram it’s like today is like the most views I ever have live right now. I guess you guys love it when I come on live at night. When I was actually go-karting I only have one view obviously it was a really short video. But anyways if you guys wanted to see my life behind the scenes, make sure you go to my Instagram channel. Other than that, that is really it for today and I look forward on seeing you guys tomorrow. Remember, like my video, follow me, do whatever, comment below tell me what you guys think and I’ll see you guys tomorrow. Bye now.